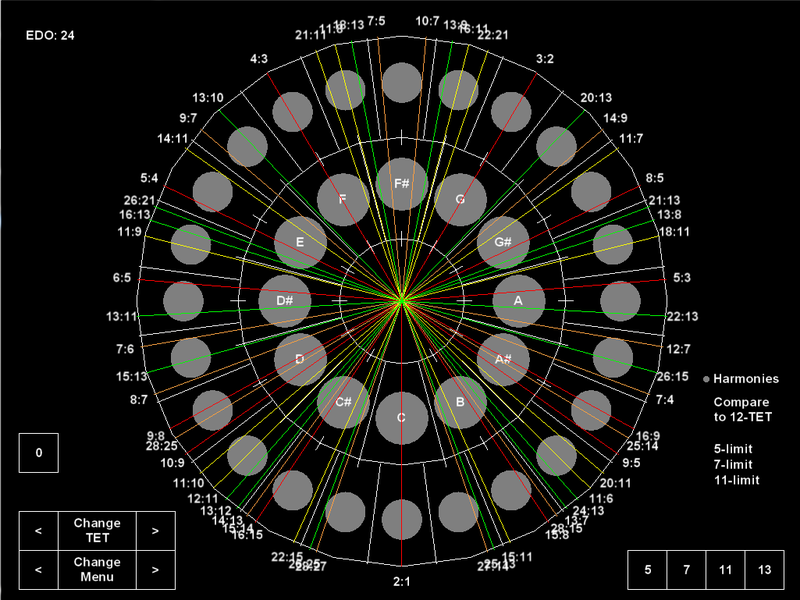 NanoTone Synth is a microtonal synthesizer and tuner. This is a useful tool for comparing the accuracy of different temperaments, and exploring unique harmonies. You can also use this to tune your instruments. 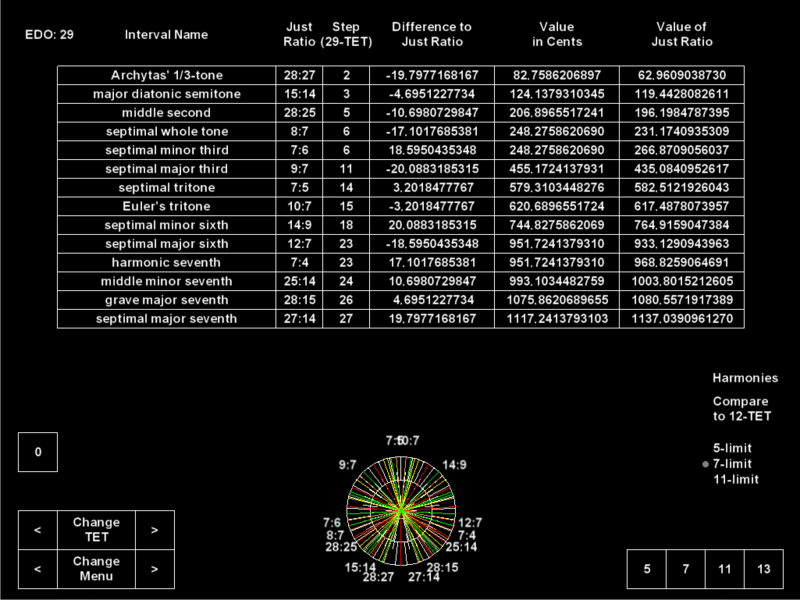 You can use this to tune a guitar in 24-TET to explore quarter tones, for example. Use the mouse, touchscreen, or keyboard to play notes. Use the left and right arrow keys to change temperament. Use the up and down arrow keys to change the menu. Use the Z and Q rows to play music. Press L to view the help page. 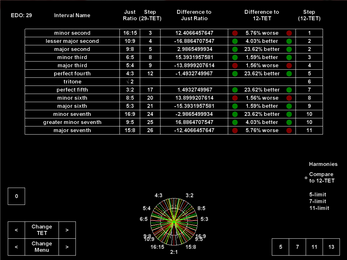 Examine any temperament between 5 and 240-TET, and compare their stats to 12-TET. 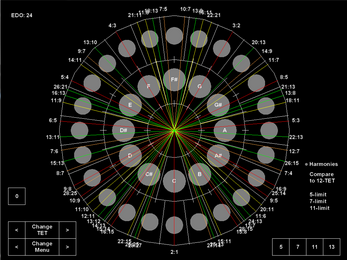 Examine the accuracy of each harmony, up to 13-limit ratios. Play music in any temperament, so you can hear the notes yourself. NanoTone Synth works with a keyboard, mouse, or a touchscreen. "Harmonies" displays two rings of circles. The inner ring shows the 12 notes used in most classical music (12-TET). The outer ring shows any temperament you choose. Use your mouse, touchscreen, or keyboard to play the notes. 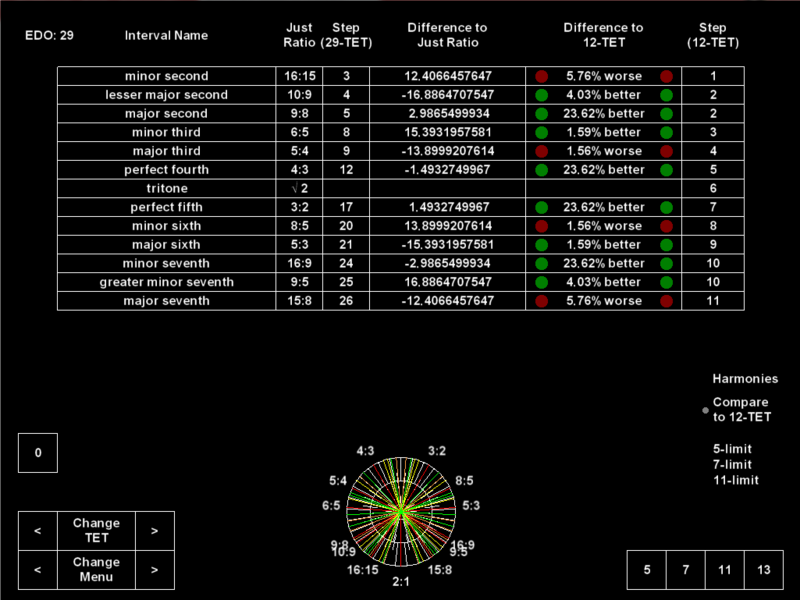 "Compare to TET" shows notes in the current temperament that are closest to the just ratios approximated by 12-TET. The menu show each note's difference to just intonation in cents. Notes more closely tuned to the just ratios than 12-TET are marked green. Notes more poorly tuned are marked red. "5-limit" displays the cent values of the current temperament, alongside cent values of the just ratios. The difference is also displayed - smaller differences are more consonant. "7-limit" displays septimal intervals, or intervals where the largest prime is 7. These harmonics are not commonly used in classical music, although the tritone can be approximated with 7:5 or 10:7. "11-limit" displays undecimal intervals, or intervals where the largest prime is 11. "13-limit" displays tridecimal intervals, or intervals where the largest prime is 13. Click "Piano" to cycle through instruments (9 and 0 keys). Click the square to toggle black and white color schemes (P key). Click the ? button for help (L key). Cents are logarithmic units that measure musical pitches and intervals. There are 1200 cents in an octave. For example, a perfect fifth in 12-TET is 700 cents, while a true perfect fifth is about 701.955 cents. 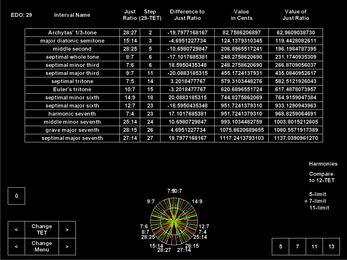 Any temperament divisible by 12 (24, 36, 48, etc) includes all 12 notes we are used to, along with additional harmonies. Any evenly numbered temperament contains a tritone. The tritone is dissonant because it divides the octave by the square root of 2, which is an irrational number. The tritone can be accurately approximated with 17:12, which is about 603 cents. You can play 17:12 by playing the 17th harmonic over a perfect fourth (17:16 + 4:3).